Nest Studio: Lucy's First Birthday - a garden party! It's hard to believe that Lucy is turning one in less than month! I'm not sure where the time has gone! While she won't remember her first birthday, it's still fun to plan a baby birthday party - no demands for Barbie or Minecraft themes, so now is the time for me to do what I want decor wise. I decided to go with a slightly girly (but not overly frilly) garden party theme, and thanks to a little help from Minted, our gathering is really coming together. Here is the concept board for what we are doing. While I doubt I will pull off quite so elaborate a shindig as some of the images suggest, the idea is there - and luckily I have a bunch of watering cans, galvanized pails, and mason jars that should help make it a true garden party. 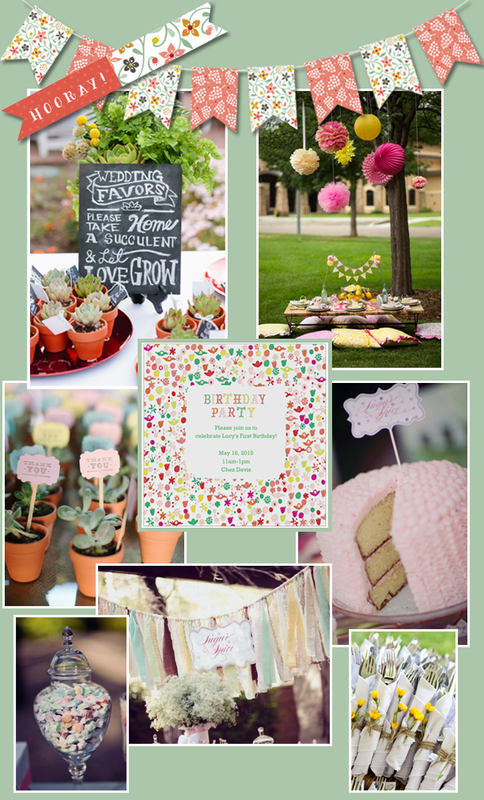 Minted is providing the Botanical Affair bunting banner, cake toppers, a table runner and confetti that really tie the decor together. And I found this cute invite on Paperless Post that reinforces the theme. Can't wait to show you more photos of the party pulled off. I am sure this 1st birthday party is going to be a blast. The arrangements you are doing are wonderful. That pink décor stuff on the tree is looking so lovely. Last night’s New York city party was also very enjoyable. I attended this party with my fiancé!